Taylor's space heating system has a couple of unique features that I like and think are worth taking a look at if you are planning a solar space heating system. One of the unique features is the use of inexpensive pool heating collectors. He adds polycarbonate glazing to the collectors to get the performance up in the same area as commercial glazed space heating collectors. The danger here is that if the collectors are stagnated (no flow), the temperatures inside the collector can get high enough to damage the the polypropylene pool heating collector. To avoid this he fits the glazing with some air leakage paths to bring the stagnation temperatures down. The glazed pool heating collector. This is the same idea that I have been looking into on our new inexpensive, off-the-shelf solar water heating system. I think this idea has a lot of promise for getting solar water and space heating costs down. But, bear in mind that its still on the experimental side. The other feature I like in the system is that Taylor uses a commercial off the shelf water to air heat exchanger to distribute the solar heat to the house. The water to air heat exchanger -- has to be one of the funkiest looking ones ever! Even with the relatively low temperature hot water that solar heating systems typically provide, these heat exchangers will deliver quite a bit of heat. 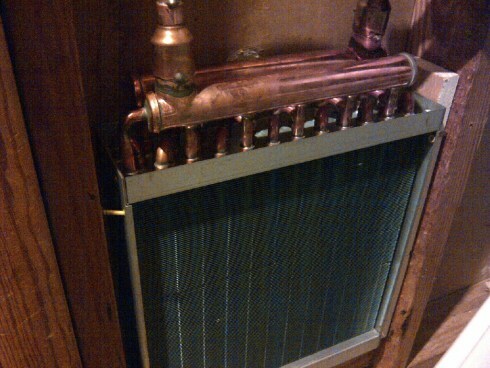 On Taylor's system, the airflow through the heat exchanger is driven by a fan that is PV powered. One thing to bear in mind about heat distribution for solar heating systems is that unless you have an exceptionally well insulated house, or a very large solar collector array, the solar heat will be a supplement that reduces your heating bill, not your only source of heat. This being the case, the thing you want the heat distribution system to accomplish is to be able to always deliver the solar heat you collect during a day to the house during that day and through the night. Its not important that the solar heat distribution system be able to supply the whole heat loss of your house on a cold day -- you have a furnace for that. 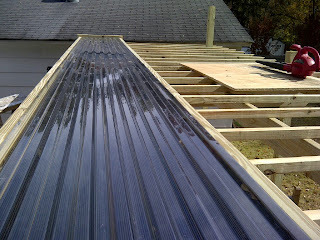 What's important is that all of the solar heat that you collect gets delivered to the house overnight. This can make a world of difference in the size of the distribution system needed. I made a solar panel and I'm glad to see its working the way i want.I did it to save money on electricity, but it is great for the environment also.